Shropshire Pools & Spas now have a range of hot tubs to suit all budgets and requirements, we are now authorised distributors for Spa Crest’s range of quality hand built hot tubs, manufactured since 1985. The range is split into 3: Spa Crest, Coastal and Vision, with 6 hot tubs in each range. Expand the horizon of your relaxtion in a luxury Spa Crest hot tub. All Spa Crest hot tubs are ergonomically designed and hand crafted to offer an attractive finish and outstanding comfort. Whatever seat in whichever model you choose, rest assured, the jet designs and patterns of each hot tub in this unique line have been carefully crafted to deliver the most therapeutic massage available. 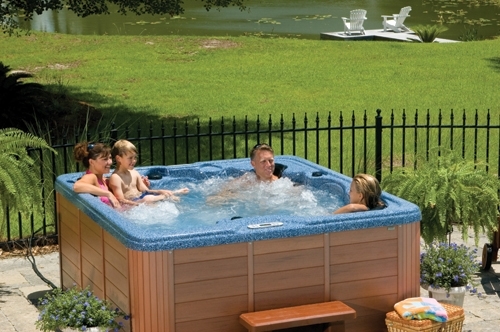 Coastal Hot Tubs offer an exceptional quality product line at great value for money. Just choose your required number of seats, and decide if you wish to have the comfort of a lounger or specially designed chair seating, and you will soon be surrounded by warm soothing waters for a renewing and invigorating experience inside and out. Stepping into your very own hot tub may seem like an indulgence, but it is truly an extraordinarily rejuvenating way to improve your overall health. With a range of six luxury models to choose from, we guarantee to find your ideal spa, handmade to your personal specifications. The ultimate relaxation experience is yours when you choose a Vision hot tub. Designed to be the best built hot tubs available on the market, each Vision model is a fantastic example of the attention to detail required to create a topline product. Choose from a full offering of available upgrades and you will soon experience the physical, emotional and spiritual renewal only Vision hot tubs can bring. Whether enjoying casual gatherings with friends, having an intimate evening for two, or total relaxtion for one, all it takes is the touch of a button and your perfect moments begin. 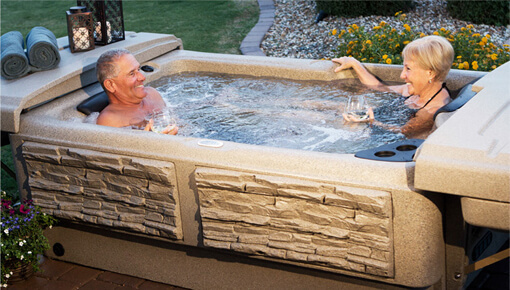 Tuff Spas are revolutionary, innovative hot tubs that are easy to use, functional, durable and affordable. With comfort and hydrotherapy performance like you would find in more expensive acrylic spas, and features like the almost indestructible and easy to use Tuff Top Cover, owning a quality hot tub has never been easier or more attainable. Every Tuff Spa and Tuff Top Cover is built to last in the harshest extremes of climate, and comes with a Lifetime Shell Guarantee! With 13A electrical rating for ease of installation, take one home today and start enjoying the home spa lifestyle!